Team Lefty – that has a nice ring to it and after the clutch play by the U.S. Team stemming the strong comeback by the Internationals it is obvious to every observer that Phil Mickelson was a key to the Presidents Cup victory…Maybe even THE key. Captain Jay Haas was questioned, criticized and even called names by so-called pundits for his captain’s picks. Not for taking his son who narrowly finished in eleventh spot outside the automatic top ten on the points list but for taking Phil Mickelson as the other pick. It seems those who made ungentlemanly even rude comments about Lefty have now disappeared and I’ve waited for the apologies to show up on the web with the same intensity as the diatribes. I guess I’m expecting so after two days I’m not holding my breath. Mickelson was on the squad because he is looked upon by the younger players as a leader and someone they can trust. Captain Haas and several of the players have said that and it was the main reason he was on the team. And by the way in case the negativism gets in the way Lefty shared the best record with Zach Johnson at 3-0-1. 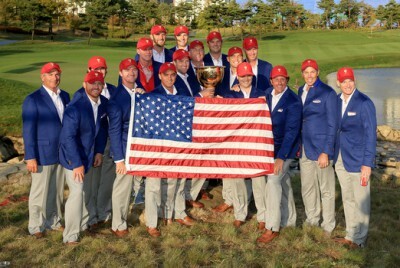 The two oldest on the team accounted for 7 of the U.S. Team’s winning total of 15 ½.